Discover the breathtaking natural attractions and wildlife of Patagonia on this fantastic journey. Beginning in Buenos Aires, experience the country’s culture and sample its tasty cuisine. Then, venture to the southern part of Los Glaciers National Park, to marvel at the spectacular Perito Moreno Glacier, one of the only advancing glaciers in the world. From there, cross into Chile to explore the impressive Torres del Paine National Park, where you can hike, ride horseback, or partake in other outdoor activities. 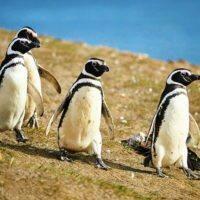 The last part of the trip takes you to Isla Magdalena, home to a colony of 120,000 Magellanic penguins. Lodging and Meals: This tour includes accommodations for 10 nights (2 nights in Buenos Aires, 3 nights in El Calafate, 3 nights in Torres del Paine, and 1 night in Santiago), and 17 meals (10 breakfasts, 4 lunch, and 3 dinners). Destinations: South America, Argentina, Chile, and Patagonia. Interests: Adventure, All-Inclusive Properties, Culture & History, and Wildlife Viewing. Places Visited: Buenos Aires, El Calafate & Los Glaciares National Park, Torres del Paine National Park, and Santiago. After passing through immigration and customs, proceed to the reception area, where our inbound services representative will be holding a sign with your name on it. You will be greeted and then transferred to your hotel. Overnight in Buenos Aires. Day 3: Buenos Aires-City Tour-Tango Dinner Show. In the afternoon, you will have a panoramic city tour of Buenos Aires. This tour will cover the most important sights in the city. You will visit the impressive National Congress (the Parliament), the Civic Centre, Plaza de Mayo, Casa Rosada, the headquarters of the executive branch of the government, and the town Hall. You will also see one of the best Opera Houses in the world. The tour will continue with a visit to the neighborhood of San Telmo, and you will learn about its history. On Sundays, you will be able to enjoy a flea market. You will go next to La Boca, known for its colorful architecture and for being the first port in Buenos Aires. This neighborhood was originally settled by Italian immigrants. You will also visit the Palermo and Recoleta areas of the city and modern neighborhoods such as Puerto Madero, with big mansions and great parks. Day 4: Buenos Aires-El Calafate. Day 5: El Calafate-Perito Moreno Glacier. Day 6: El Calafate-Boat Tour of Lago Argentino. Day 7: El Calafate-Torres del Paine. Transfer to your hotel in Torres del Paine (the transfer to Hotel Las Torres is scheduled for 7:00am and to Tierra Patagonia 8:00-9:00am). Torres del Paine National Park is one of the best parks for outdoor enthusiasts in South America. It offers camping sites and vast hiking trails in the midst of a spectacular natural setting that includes forests, blue and green lakes, glaciers, and the granite peaks – ‘Towers of Paine’ – for which the park is named. Day 8: Torres del Paine. Day 10: Torres del Paine-Punta Arenas. Day 11: Punta Arenas-Magdalena Island Penguin Tour-Santiago. In the morning, you will travel by boat to Magdalena Island, a small island and protected nature reserve in the Straits of Magellan, which is home to approximately 120,000 Magellanic penguins. You will disembark to observe the penguins and learn about their habitat and breeding cycles at a lighthouse exhibit located on the island. Weather permitting, you will also circumnavigate Marta Island, home to a colony of 1,000 sea lions and other wildlife. Note: This tour is only offered from October to February. During March, other options will be considered. Group Private: All airport/hotel transfers are private, except for El Calafate-Torres de Paine, and Torres del Paine-Punta Arenas. In Buenos Aires, the Panoramic City Tour and Tango Dinner Show (transfers) are group tours for single passengers and 3 Star accommodations, and private for 4 Star, 5 Star, and Deluxe accommodations. In El Calafate, the excursion to Perito Moreno Glacier and boat tour of Lago Argentino are group tours. In Torres del Paine, all excursions are operated on a small group basis. The Magdalena Island excursion is a group tour. Elevations: Torres del Paine National Park elevations can reach 4,000 feet or more, depending upon your itinerary, and Santiago is 1,700 feet. Passport/Visa: For Argentina, U.S., Australian, Canadian, and EU citizens require a valid passport (for the duration of your visit) and return ticket for stays of up to 90 days. Australian and Canadian citizens are required to pay a reciprocity fee of $100 and $75 respectively (subject to change without notice due to currency fluctuations or other reasons) online, and must show proof of payment prior to arrival. The reciprocity fee for U.S. citizens has been suspended until further notice. For citizens of Australia, this fee covers unlimited entries to Argentina for 10 years, while citizens of Canada are charged the fee every time they enter the country (or $150 for multiple visits within five years). The fee can be paid online at ProvinciaNet.com.ar. You will need to register in order to make the payment. Citizens of other countries are advised to contact the embassy of Argentina in their country before traveling. For Chile, U.S., Australian, Canadian, and EU citizens (except Greece) require a valid passport (for the duration of your visit) and return ticket for stays of up to 90 days. Greek citizens can stay for up to 60 days. Australian, and Canadian citizens are required to pay a reciprocity fee (considered a multiple entry visa) of $95 and $132 respectively upon arrival (subject to change without notice due to currency fluctuations or other reasons). Citizens of other countries are advised to contact the Chilean embassy in their country before traveling. To Book This Trip: We require a non-refundable deposit of $900 (3 & 4 Star) or $1,250 (5 Star & Deluxe) plus the cost of the airfare (if we arrange it for you). The balance of the trip cost is due 60 days prior to departure.